Ear worms. That’s the rather icky term for those songs you can’t get out your head. Sometimes, you can’t stop humming them (as annoying as humming is…), but is there a word to sum up those and find your feet moving to them? On a crowded Tube platform? 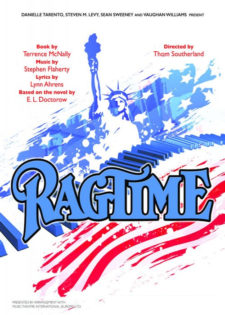 If “insanity” and “justifiable homicide” come to mind there is only one reason: you obviously haven’t been to see RAGTIME at the Charing Cross Theatre. Seeing Jonathan Stewart (GUYS & DOLLS) again was my impetus, and he was fantastic, as I knew he would be. Maybe two minutes in though, my single reason lost its creepy stalker focus as I was swept up in this astonishing production. CC Theatre is a wonderful, intimate venue with a stage of the size you would imagine. Not where you’d expect to see a cast of over twenty playing multiple roles and multiple instruments. Yes, they also the musicians. And they were jaw-dropping to hear AND to watch. When Simon Anthony wasn’t swapping a banjo for a mandolin or a guitar, he was the repulsive racist Willie Conklin. And he’s a proper Fred Astaire. The infamous beauty Evelyn Nesbitt was also the brilliant cellist. And played the recorder. (And to think we all made fun of it in third grade…) Oh! And the singing, dancing, acting, Joanna Hickman. I could single out every cast member and, actually, I feel amiss for not doing so. Every actor had to be able to sing to achieve Mark Aspinall’s wall of voices. Gary Tushaw could have filled the theatre with his voice alone, but tempered it perfectly for his duet with Anita Louise Combe. Add Jennifer Saayeng’s powerful pipes that swept up in into some of the sweetest notes possible. Sweeping the audience up on a tide of sound that could fill the most cavernous West End theatre. I must add a special ovation for Alana Hinge and Ethan Quinn (The Little Girl and The Little Boy, respectively). Too many child actors either gush, appear limp as rag dolls, or mumble their lines; not these two young professionals. Miss Hinge played Tateh’s daughter and in their scenes together, especially their musical numbers, she played back his energy and they supported each other beautifully. Master Quinn is a natural: relaxed, yet energetic, born to be on the stage. And thank you, Ethan, delivered his lines in a clear, distinct voice so that I was finally able to understand his instruction to Houdini. Casting must have been the most complex since…well, I can’t think of one as complex. If you don’t already know the story of RAGTIME I won’t heap scorn on you. Yes, I will. Shame on you! It’s not just a story of an era that shaped America; it came to affect the world. Okay. So. I went two nights in a row. Saturday *sob* I flew back to the U.S. for a few months and there was a long list of productions I could see, but decided to stay in instead. After puzzling my puzzler though, I realised what I really wanted. Yep, if you were there, that was me in M9, definitely underdressed for the theatre, but I just HAD to listen to the RAGTIME, one more time.